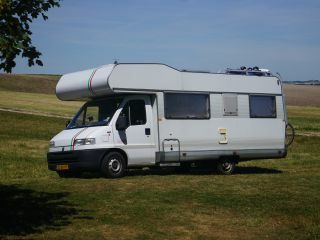 Family Camper: Everything Erop and Eraan - New adjusted prices! A camper is so cool! You arrive and you turn off the engine. Seats and table out and unscrew the canopy. Ten minutes after arrival you are having coffee or an ice-cold rosé from the fridge. All clothing is in the cupboards, beds are still made. Nowhere else to look further. This motorhome has almost everything! In addition to four permanent sleeping leaks, the seating area can be quickly converted into a bed. The alcove (fold away so that you experience a pleasant space above your head while driving) has a bed of 1 meter 40 by two meters! This has a luxurious top mattress on the mattress. In the back a fixed 'french' bed with a luxurious top mattress on the mattress. 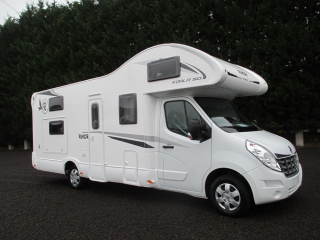 The camper is therefore ideal for a family with two (or three) young children. 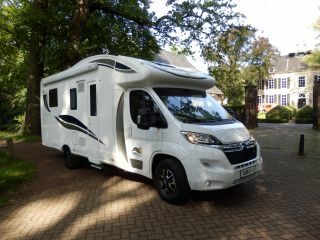 This motorhome drives best on flat and slightly hilly terrains. In the real mountains (Austria / Switzerland) it is not really at ease (but this applies to more large motorhomes). If you 'turn on' everything below in your search with 4-5 sleeping places, this is the cheapest and most extensive camper that comes to the fore! We do not charge extra costs for seats, navigation, etc. (you will see that sometimes). • 1000W inverter with permanent 220V, even while driving! • Four roof hatches, three with a fan (optionally fresh air in or hot air out). The large roof hatch (2018) is remote controlled and closes automatically when it rains :-)). We still have to experience. • Plenty of storage space (including a cupboard). So no bags or suitcase needed. Everything in the cabinets and drive! Available in the booking process, from £14.80 per day you can reduce your deposit and deductible to £150. There can always go a little piece. When it concerns their own possession, you buy a new or let you fix it. We kindly ask our tenants. Hence the excess. Also, like your driver's license at least three years without damage. Such RV is really bigger than you think. And higher (I speak from experience, hahaha, ouch).